The Mac project dates back to the late 1970s and original creator Jef Raskin. Raskin had the revolutionary (and, today, decidedly un-Apple) idea to build an easy-to-use personal computer that everyone could afford. He targeted a price point of $500 or less. While that’s equal to $1,650 in today’s money, it was far cheaper than the Apple II, which cost $1,298 in 1970s money. Even a low-cost TRS-80 — a fairly bare-bones computer sold at Radio Shack — cost $599 at the time. Apple changed the spelling, however, since the name already belonged to a high-end audio equipment company called McIntosh Laboratory. Jobs convinced McIntosh to let Apple use a variant of the name, with the two companies agreeing to a financial settlement. The signatures of the original Mac creators. The Macintosh wasn’t Apple’s first mass-market computer (that would be the Apple II). Nor was it the company’s first machine to use windows, icons and a mouse pointer (that would be the Lisa). But the Mac brought together ease of use, a focus on personal creativity, and a belief that users deserved something better than the green-text-on-black-screens that was more or less ubiquitous at the time. The Macintosh 128K boasted an 8 MHz processor. The “128K” in its name indicated the computer’s RAM. 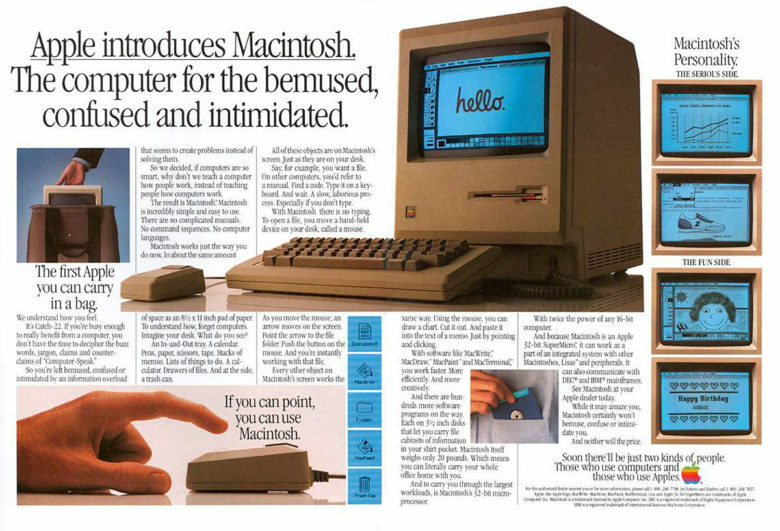 The first Mac featured two serial ports, and could accommodate one 3.5-inch floppy disc. It ran Mac OS 1.0, arrived with a 9-inch black-and-white monitor, and carried a price tag of $2,500 (the equivalent of around $5,000 today). The first Mac actually sold disappointingly for Apple. (That’s one reason the Apple II product line continued for the best part of the next decade.) It took at least two more iterations before the Mac truly hit its performance and commercial stride with the Mac SE/30 model. However, the original Mac 128K remains iconic — and for very good reason. Happy birthday, Mac! Did you own an original Macintosh 128K? What was the first Mac you ever used, and how did it change your life? Tell your Mac-tastic stories below.